Suldog: Rabbits & Pigeons & Turkeys - Oh, My! Rabbits & Pigeons & Turkeys - Oh, My! I don't know what else to tell you about today's column in the Boston Herald. I suppose I could throw in squirrels, possums and skunks, but that's about it. Soon, with more better stuff. Ms. GA has a raccoon that is becoming more bold about walking up and asking to be fed when she's tending to her feral cat colony. It needs to be trapped and relocated. Excellent point about rabbits...no wonder almost everyone likes rabbits...unless of course you are trying to grow a garden. Another great read from the pen (or more likely the keyboard) of the now almost famous Boston Herald contributor of words of wisdom, Suldog. I like bunnies. There was one in my back yard last week. So cute! Thanks for reading, my friends. I sure do appreciate it! I've seen plenty of wild turkeys out in the countryside, but never in town. 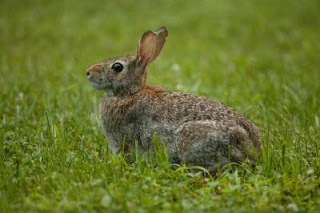 . .
We've got three different kinds of squirrels in OurTown, and we do see rabbits, as well. The black squirrels were actually a genetics research project at the university, once upon a time; then some animal-rights folks went and threw the cages open, and we've had a mini-plague of black squirrels ever since. . . I actually prefer the company of rabbits, squirrels, pigeons, turkeys, possums, and skunks to that of the two-legged version of the species ( no offense to pigeons and turkeys ). love this post--love the animals !!! Linda (REDNECK?? )IN Tn. I don't mind rabbits if they aren't in my yard...they tend to eat my rather stupidly expensive flowers. Our wildlife includes deer, coyotes and bears, with a mountain lion thrown in every now and then. My favorite is the prairie dog. They are very comical, standing in the "door" of their burrow, barking to warn all the others if you're walking your dog. Some build their burrow right next to the road, which acts as a form of animal control. We had one in our garage once, and we had a devil of a time getting the poor thing out, it was terrified. While living in Oregon, we discovered ~ by the hissing ~ a family of opossum living under the bathtub in the downstairs bathroom. Nice. We also have no shortage of possums. Disgusting critters. . .
Two For One! FREE! FREE! FREE!